Automation Engine serves as the heart of any size prepress production operation. It enables unparalleled workflow automation with rock-solid quality control. Automation Engine comes with extensive business system integration capabilities and is highly scalable. This flow receives files from an FTP site and a mail account. Several strategies are then used to find a matching Automation Engine job into which Switch will deliver the file. 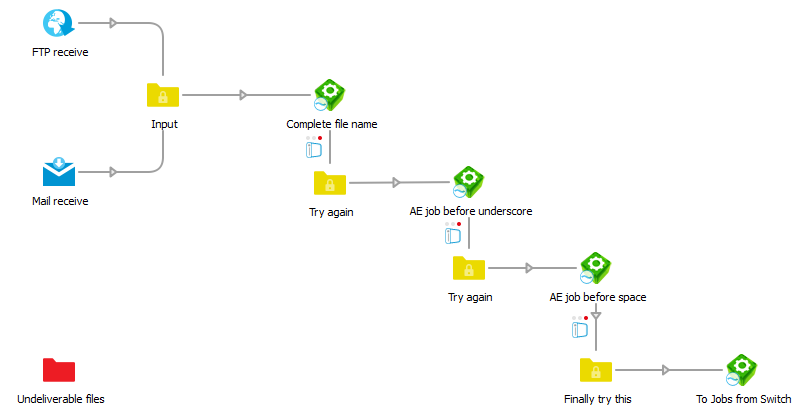 The first strategy is to check if there is an Automation Engine job name that contains the name of the incoming job. If there is, the job is delivered and the flow ends. If not, then a second strategy is tried out: the first part of the file name before an underscore is used to find an Automation Engine job of which the name or the customer job reference field contains that string. The third attempt uses the same strategy as the second, but with a space instead of an underscore. The final strategy is to deliver the job in a fixed Automation Engine job where all files that cannot be attributed are collected. This can for example be the case when files are being delivered ahead of creating the job in Automation Engine. There is no limit to the number of attempts that can be made to find a matching Automation Engine job. In case all attempts fail, for example, because the Automation Engine is temporarily not reachable the files will end up in the Problem jobs folder.